Proposed levy increase under discussion: The DINZ board is still seeking feedback on the proposed venison levy increase to fund more on-farm environmental activity. It proposes lifting the levy 1 cent a kilogram. This would be partially offset by a reduction in the amount DINZ collects to help fund the TbFree programme by half a cent per kg of venison and 5 cents per kg of velvet. At the same time a 1.5 c/kg charge would be introduced to fund DeerPRO (formerly Johne’s Management Ltd), replacing a 90 cent per carcase voluntary charge by processors. Confused? See the calculations in the editorial of August Deer Industry News, due in your mail box this week. If you have any feedback about the proposed changes, please contact DINZ chief executive Dan Coup, a member of the DINZ board or your local NZDFA branch chair. Looking for help with your Farm Environment Plan? Deer farmers wanting some guidance on environmental management or to help with a farm environment plan (FEP) for their properties can now join a Deer Industry Environment Group, to find out how to go about it. The groups, which could be run in association with local NZDFA branches, will be facilitated by environmental consultants who are familiar with regional council plan requirements. The aim is to help the industry achieve the NZDFA target of having all deer farms with FEPs by 2020. Wintering systems in the spotlight: In recent times the public and regulatory spotlight has increasingly been shining on livestock standing in winter mud. Usually this involves cattle, sheep or deer being intensively wintered on fodder crops or in sacrifice paddocks eating conserved feed. Concerns include animal welfare, the flow of contamination downhill into waterways and, on free draining soils, contamination of ground water. 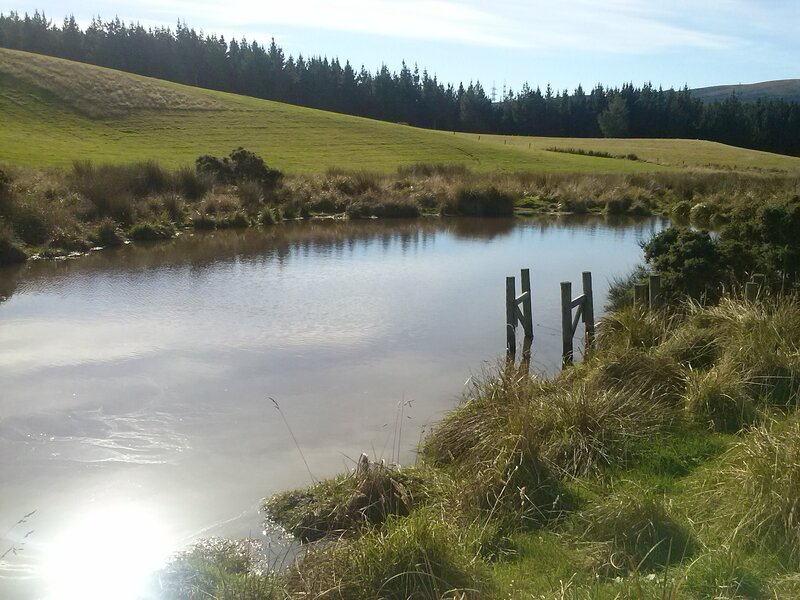 The issue has now come to a head in the Hawkes Bay, where a local businessman has taken the local regional council to the Environment Court over what he believes is failure to regulate feedlots and protect waterways. Interestingly, the definition of a ‘feedlot’ appears to be an intensively farmed block of pasture land which is grazed for 15 days or more in a 30 day period. 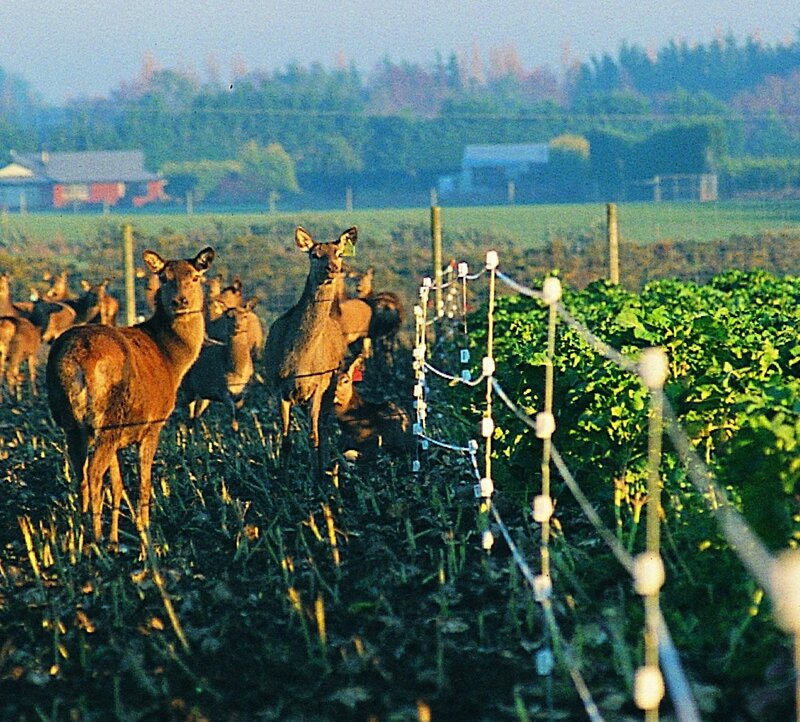 In Southland, where wintering on crops has always been the norm, members of the Southland Environmental Advance Party have – among other things – been looking at wintering options that are friendly to their deer as well as to the environment. Active promotion of Cervena in Europe: Venison marketers are meeting in Wellington this week to discuss feedback from their Cervena marketing campaigns during the European summer. The development of off-season premium chilled markets for Cervena is a major objective of the P2P programme. This is the fourth season that summer Cervena has been promoted in Belgium and the Netherlands and the first season it has been promoted in Germany. Three marketers – Silver Fern Farms, Alliance Group and Duncan New Zealand – are involved this year. They share their feedback with DINZ and the other venison marketers who are all partners to the P2P programme. 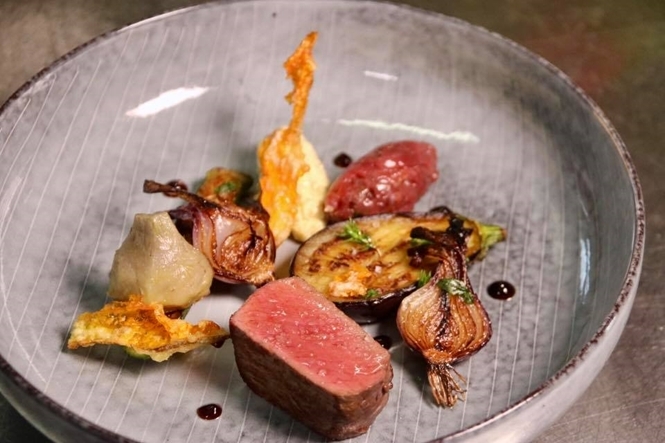 This year, five restaurants around Germany were selected to offer a Cervena tasting menu for at least two weeks, to complement the sales support activity with German distribution companies. This was kicked off with a dinner for food writers and bloggers at Michelin star chef Carmelo Greco’s restaurant. All the restaurants promoted their menu and Cervena through their social media channels. In Belgium and the Netherlands, DINZ is working alongside the companies in their promotional activities. It has also worked on building the social media profile of Cervena by encouraging a large number of chefs to develop a summer dish and to then post a photo if it on Instagram. Feedback on the success of this year’s promotions will be reported in DINZ eNews when the results come to hand. New technology a double-edged sword? Deer farmers haven’t wasted time embracing the power of drones to give a much clearer picture of what’s happening on the ground. Pasture covers, crop growth, the state of water troughs and animal welfare can all be checked easily using an eye in the sky. They can also lend a hand moving stock. But Waikato University philosophy and ethics lecturer Dr Nick Munn has suggested that new technology could have unexpected and unwelcome consequences. Speaking to Wallace Chapman on National Radio’s Sunday Morning programme, Munn said drone flyovers made it possible to monitor stock welfare more often. This could lead to unfair public expectations that stock welfare should be monitored far more intensively than before. He also warned that welfare activists – the types who break into dairy sheds or piggeries to install hidden cameras – could use drones to conduct surveillance on farms. This could open the way to “speculative spying”, where there was less chance of being caught, Munn said. He added that the law needs to be constantly updated to keep up with technology. 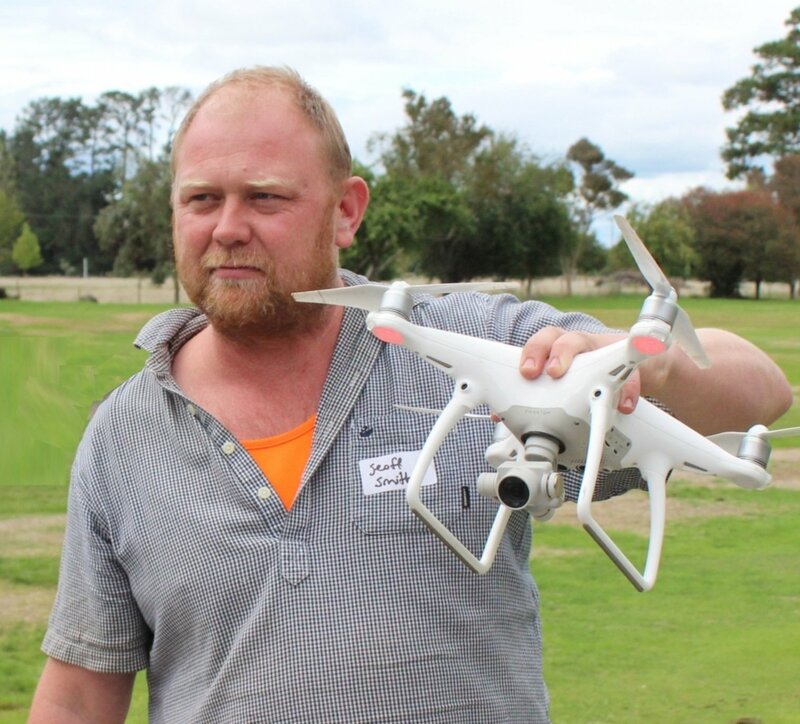 Hawkes Bay deer farmer and drone enthusiast Geoff Smith. Photo: Phil Stewart. 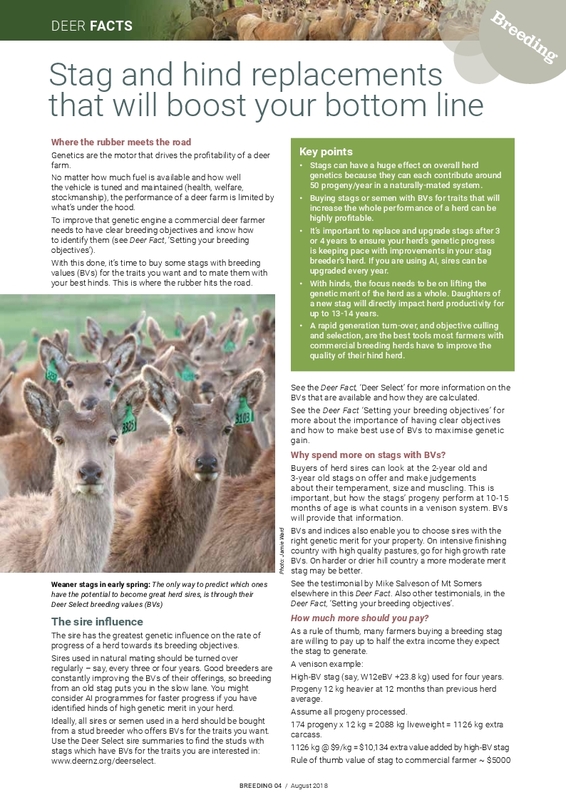 Deer Facts in DIN: When you open the August issue of Deer Industry News you’ll find the latest two Deer Fact sheets: ‘Setting your breeding objectives’ and ‘Stag and hind replacements that will boost your bottom line’. P2P manager Innes Moffat says these Deer Facts encourage farmers to make more use of Deer Select breeding values when selecting replacements. They also reinforce the importance of rapid generation turn-over and objective culling and selection to improve the quality of hind herds. “The farmer case studies in these Deer Facts show that genetic improvement can be a very profitable investment,” Moffat says. Deer museum for Wanaka: A museum dedicated to red deer and their antlers is due to open near Wanaka Airport in a couple of weeks. The World of Deer is a venture by retired red deer stud breeder and former DINZ chair Clive Jermy, and partner Harry Yu. The largest set of antlers on show will be a replica of the 23.4 kg head taken from the 9-year old stag Hotspur shot by a wealthy Slovakian hunter at a safari park in the Cardrona Valley nine years ago. Jermy says the “educational” museum will target both overseas and New Zealand visitors to Wanaka. It will also offer deer-related items for sale, from heath food products to antler carvings and knives with antler handles. 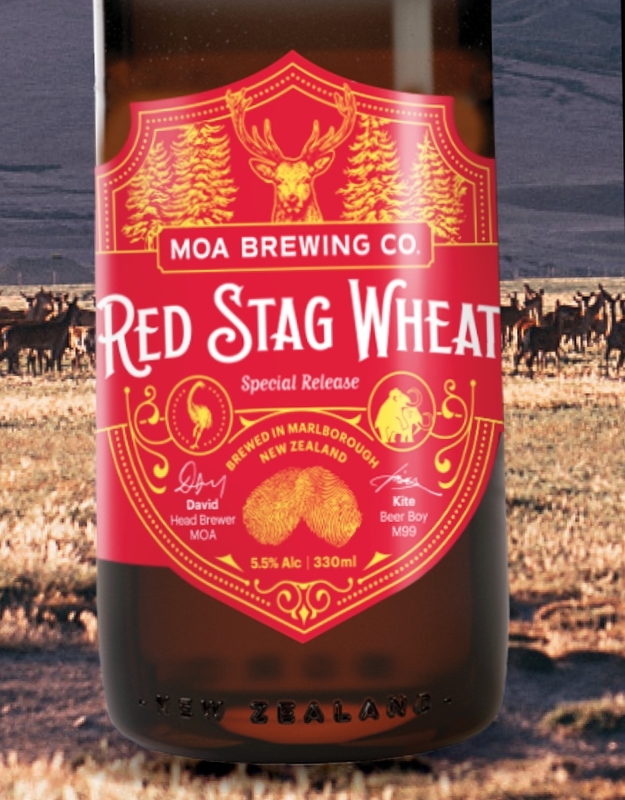 Moa brews the first deer beer: NZ craft brewer Moa has developed ‘Moa Red Stag Wheat’ craft beer, containing NZ deer velvet, exclusively for export to China. A container-load of the beer sold out in 48 hours, following a post on social platform WeChat by distributor M99. Moa says the beer has a unique red-tinged hue and robust flavours from Nelson hops. A second trial shipment is now heading for the city of Chengdu where M99 has six stores.